My husband left a page open in Firefox for me earlier this week. A restaurant. A gluten-free restaurant no less. One I hadn’t heard of. One that was just a short bike ride from our house. I asked on our Gluten-free Portland facebook group if anyone had been there, and how on earth did I miss it? Well, it’s apparently only a few months old, but still. Opened by the Fuego de Lotus cart folks. 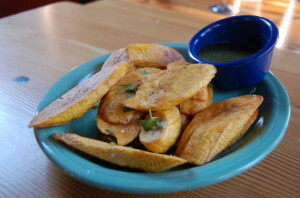 Venezuelan inspired, traditional Arepas topped with Latin American inspired street food. It’s one of those order at the counter places. 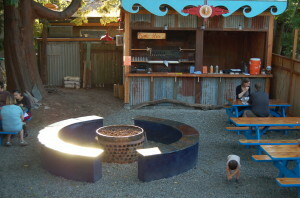 We arrived at 6pm on a Saturday and it was virtually empty save for a few folks out on the back patio. I assume it will be busier later. 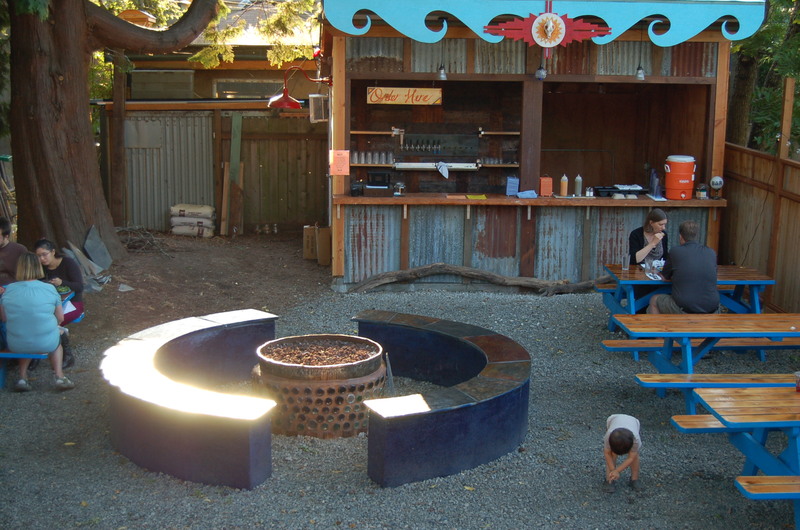 The back patio is a bar and has a lovely fire pit. Made me want to make a date with some friends to hang out there. It also appears that a bar is soon to be opening upstairs as well. 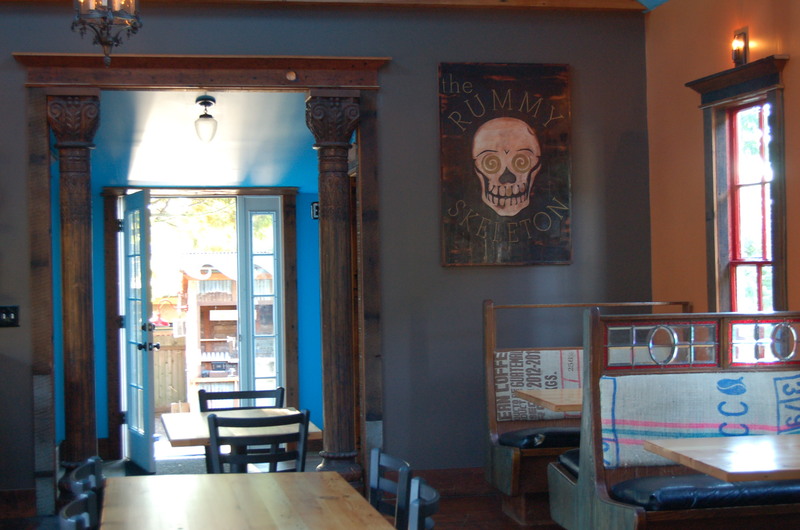 The restaurant bills itself as “all allergen and gluten-free, as well as locally sourced.” It is, indeed gluten-free (with the exception of the beer) but not allergen free, if you consider dairy an allergen. They butter the arepas and include queso fresco on many dishes, and cheddar and other dairy products in the Sunday brunch. That said. they were very accommodating when we requested no dairy on anything. My son started with a blackberry sage agua fresca. Fresh juice with sparkling water. It was served with 2 big fat blackberries floating on top. I wanted to snap a pic but they were already in my kid’s belly before I could turn on the camera. 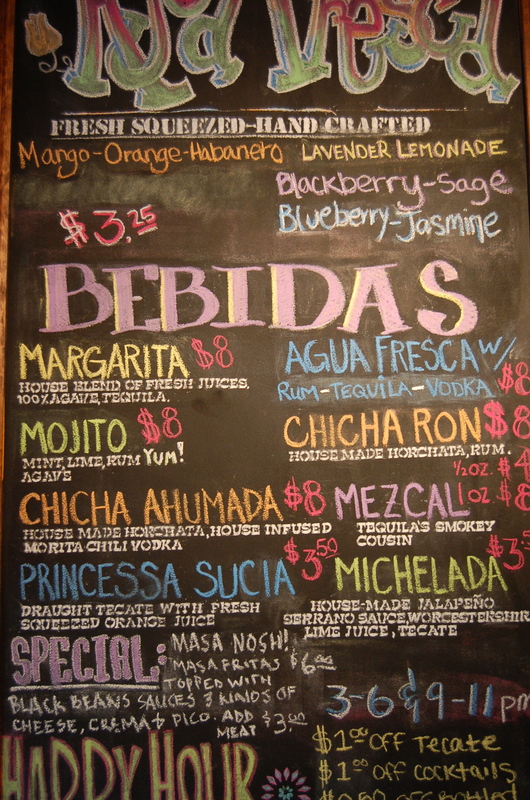 The menu looked great. I am always particularly happy to see that I can get gluten-free and ethically sourced meat. 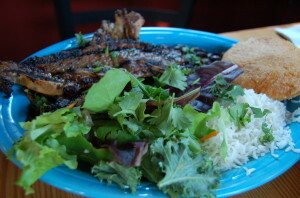 For dinner I got one of the larger plates, grilled Fino ribs. Painted Hills flanken ribs marinated in a serrano chili and cilantro sauce, served with beans, rice, salad, fried plantains & arepa. The meat was delicious and fatty (a little too fatty for my taste but I’m fussy like that, my husband loved it) and the arepas absolutely perfect. It didn’t show up with plantains but we had gotten them as an appetizer. They were starchy, not sweet, and served smothered with a delicious slightly tart and slightly sweet verde sauce. My son and husband both got the arepas. I wish I had too because they were absolutely fabulous. Next time. Smokey Pollo $6 Braised Draper Valley chicken topped with cabbage salad, verde sauce and plantain red chili sauce and queso. Pabellón $6 Shredded Painted Hills flank steak sautéed with peppers, topped with black beans, verde sauce, plantain red chili sauce and queso. The best thing though, about the restaurant was the décor and vibe. Everywhere you look there’s something lovely and bright. So glad it’s nearby! File this under “ridiculously late notice”, but I only just saw it today, I swear! Tomorrow, Tuesday, May 7th at 7:30PM, author Shauna James Ahern (a.k.a. 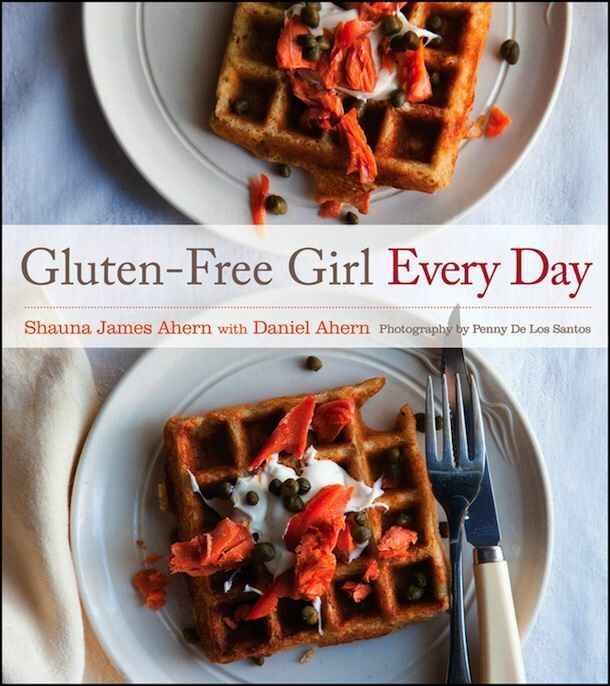 Gluten Free Girl) will be at Powell’s Books W Burnside signing her book, Gluten-Free Girl Every Day . Here is Powell’s blurb from their events email. An approachable gluten-free cookbook intended for home cooks making dinner for their families, Shauna Ahern’s Gluten-Free Girl Every Day (Houghton Mifflin Harcourt) features food you want to cook every day: fresh, satisfying, and filled with great flavors. Here is the flyer for the Spring 2012 Gluten Free Food Fair (download PDF here). 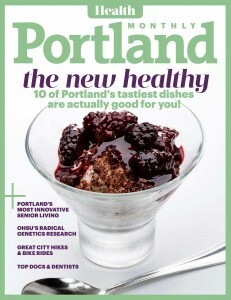 This event is organized by the Portland Metro Gluten Intolerance Group (GIG). It looks like this is going to be the biggest one ever. How Much: $5 per person, $10 per family, Kids under 12 free! 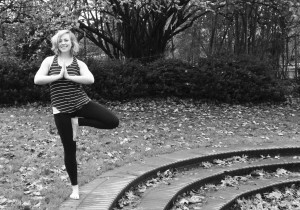 Lisa Shaver sent us a schedule of speakers for the fair (last updated at 8:00 AM 5/1/12). We’ll try to update it as she sends us more information. Note that the Gluten Free Food Fair is organized by the Portland Metro GIG. Although we support the Portland Metro GIG, we are not affiliated with them. It is admittedly infrequent that the paths of a beer maker and gluten-free blogger cross. I do get invited to events here and there, and the first of 2012 happens to be the press event for Omission beer. 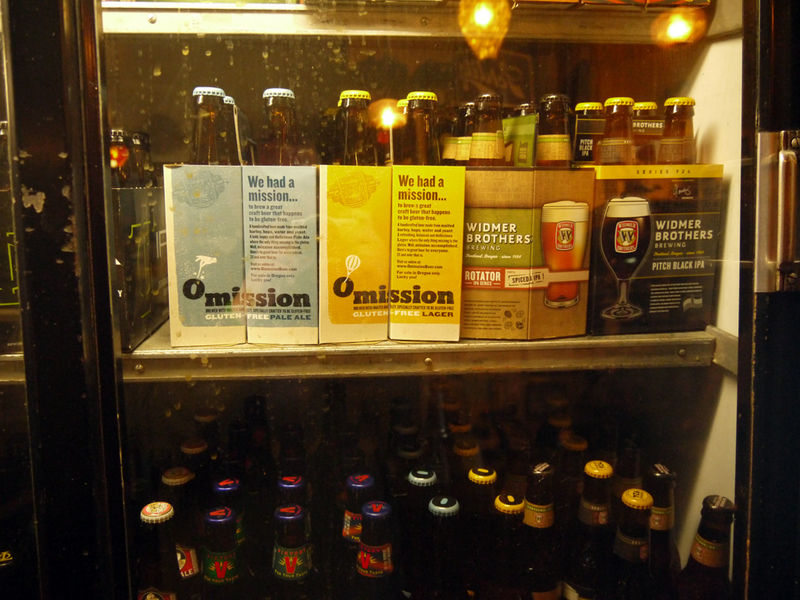 Omission beer is made by Widmer Brothers, a division of Craft Brew Alliance, both of which are Portland-based. The event was hosted by Saraveza, which, judging from the menu, is definitely not a gluten-free friendly place, but which has a great little spot around the corner for events like this. The event was made up of PR people, local bloggers, local media, and some folks from Widmer. I brought along the Gluten Free Portland official beer correspondant, Heather Marsh. 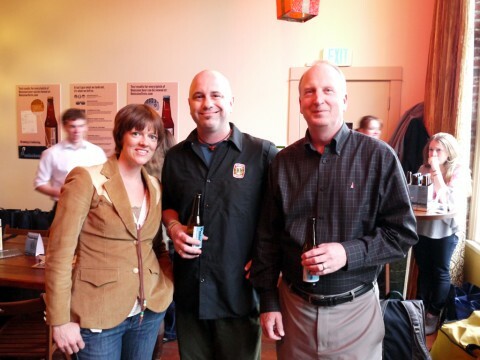 Pictured above are Mieke from Tula Baking (who provided some of the treats for the event), Widmer brewmaster Joe Casey, and the CEO of Craft Brew Alliance, Terry Michaelson. Casey’s wife is celiac, as is Michaelson. We spent some time talking with both of them, swapping stories about trying to find places to eat while travelling, and comparing notes on favorite restaurants and bakeries in town. It’s nice to walk into an event where the first thing that happens after introductions is that someone puts a beer in your hand. I was really curious to see what the beer tasted like, and had one of those “oh yeah, that’s what that tastes like, I had forgotten” kind of moments when I had a drink of the Omission Pale Ale. It had literally been years since I’d had a real pale ale, but I could have told you what I was drinking without having to check the label. The company notes that Omission was six years in the making. It’s unique in that the beer is brewed with normal beer-making ingredients like malted barley and hops, and the gluten is removed during the process. 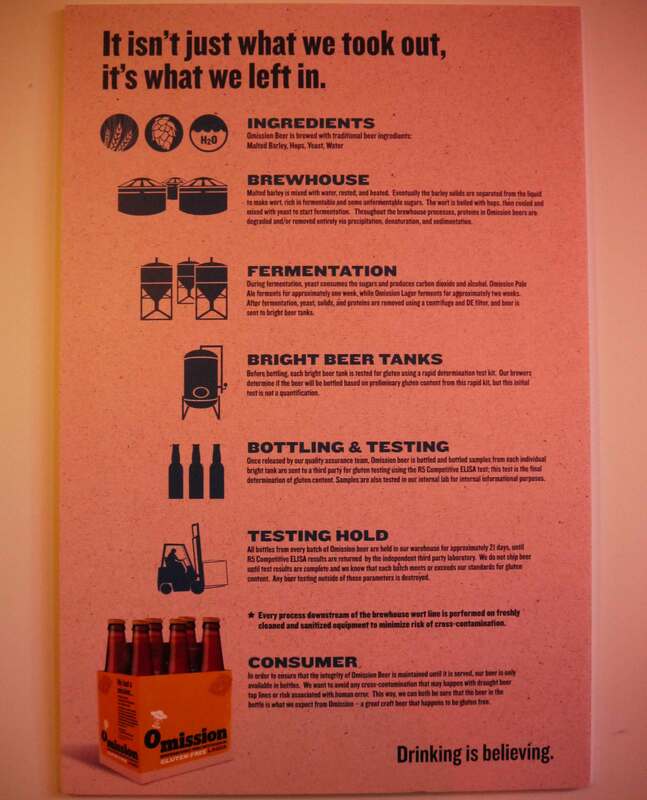 Then the beer is batch-tested by an independent lab to make sure that it falls below the international standard of 20 ppm of gluten (the company claims that they go further and test to 6 ppm). Neither Casey nor Michaelson were willing to go into the nitty gritty details of how they remove the gluten, but would say that “it’s complicated”. One of the posters at the event went into further details, saying “Throughout the brewhouse process, proteins in Omission beers are degraded and/or removed entirely via precipitation, denaturation, and sedimentation.” And later, “After fermentation, yeasts, solids, and proteins are removed using a centrifuge and DE filter…” (I’m thinking that it’s pretty safe to take the words “proteins” in these two sentences and substitute “gluten and other proteins.”) Before they bottle it, the beer is “rapid tested” for gluten in the bright beer tanks. The beer is then bottled and sample bottles are sent out for independent gluten testing using an R5 Competitive ELISA test. One very interesting thing that they’ve done is that you can go online and check the test results of the batch you’re drinking. 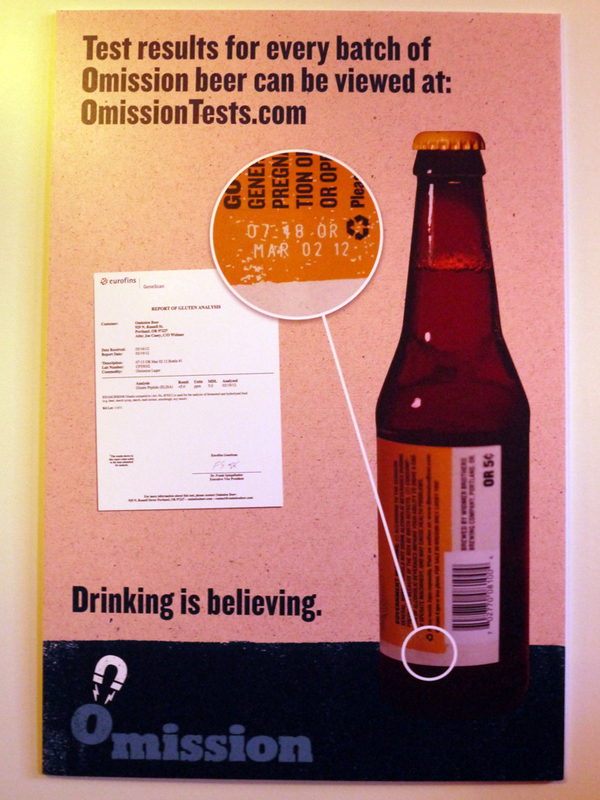 To do so, you go to omissiontests.com and enter the date stamp information from the bottle. Here are the test results from the bottle I had last night. Omission is not yet available outside of Oregon. Widmer plans to begin distributing the beer nationwide as soon as the necessary details are worked out with the TTB (the Alcohol and Tobacco Tax and Trade Bureau of the U.S. Dept of the Treasury). As many of our readers know, the FDA is still getting its act together about all things gluten-free, so there’s not much going on there. With any luck, people outside of Oregon will be drinking gluten-free lager sooner rather than later. Also mentioned at the event, Widmer is working to expand their gluten-free offerings to include more varieties of beer. They don’t seem to have any plans to supply the beer in draft form, which makes sense because of the risk of cross-contamination from the lines. With Omission, I think that Widmer is going to have a hit on their hands. Both Heather and I thought that the Omission Lager was good, but both of us preferred the Pale Ale. I asked a bunch of the beer bloggers in the room what they thought, and everyone agreed that the beer was good. One person noted that the pale ale was just a little sweet. Nobody I talked to thought that there was anything funny or strange about the taste. In this case, saying that “it didn’t taste funny” is akin to attending a Cirque du Soleil show and declaring that the performers “somehow managed to totter across the stage with their crutches.” But considering that we’re talking about gluten-free beer, it needed to be said. As I mentioned above, I had one of those moments where I tasted the Omission Pale Ale, and remembered drinking other pale ales years ago. I’m not an expert, but to me Omission tasted crisp, flavorful, and well-balanced. We were given lots of samples on our way out the door, so hopefully soon we’ll have a more thorough report from Heather and her cohorts. Look for Omission at your local retailer. You can also go to the source, the Widmer Gasthaus on North Russell. 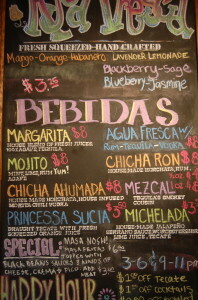 They have recently expanded their menu to include plenty of gluten-free items. We plan to visit soon and will certainly post the results here. Thanks to Widmer for the free beer! A few weeks ago, I posted about a mysterious invitation I got to a beer tasting event. The event was delayed until next week, but today I got a press release from them. Here it is in its entirety. It mentions that the beer is brewed using barley, which is a source of gluten. I’ll be curious to hear what they’re doing to remove the gluten from the beer. The press release also mentions that the CEO is celiac, and so is the wife of the brewmaster. PORTLAND, Ore. – March 26, 2012 – This spring, Craft Brew Alliance will launch Omission Beer, the first craft beer brand in the United States focused exclusively on brewing great-tasting craft beers with traditional beer ingredients, including malted barley, that are specially crafted to be gluten-free. 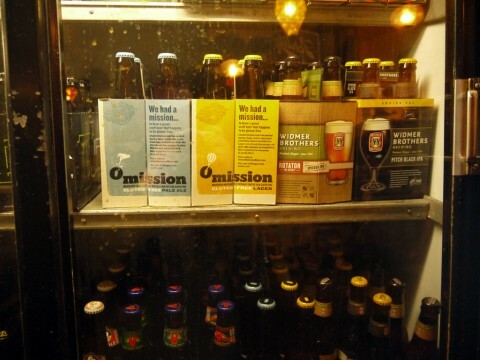 Omission beers are brewed by Widmer Brothers Brewing in Portland, Ore., which uses a proprietary brewing process to reduce the gluten levels to well below the widely accepted international gluten-free standard of 20 parts per million (ppm) for food and beverages. (The international gluten-free standard was set forth by the Codex Alimentarius Commission, which was created in 1963 by the Food and Agriculture Organization of the United Nations and the World Health Organization.) Omission Beer is expected to release the first beers in its portfolio, which will be available only in Oregon, on April 2. Unlike many other gluten-free beers currently available, Omission beers are not brewed with sorghum, rice, tapioca, buckwheat or quinoa; they are brewed using traditional beer ingredients: malted barley, hops, water and yeast. Each batch of Omission Beer is tested by an independent lab to ensure that all Omission beers contain well below 20 ppm of gluten. Gluten levels in Omission beers are tested using the R5 competitive ELISA test. Beer will not be released to consumers until test results are received and after an extended quality assurance hold. 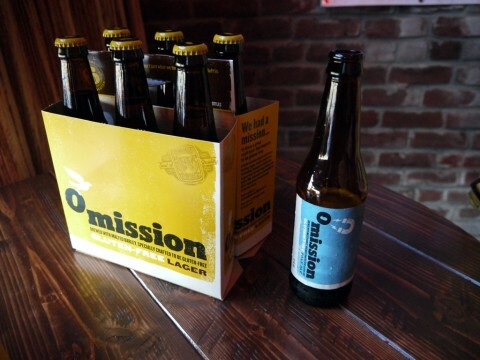 Omission Beer is a new brand of gluten-free craft beers, available only in Oregon. Brewed by Widmer Brothers Brewing in Portland, Ore., Omission is the first craft beer brand in the United States focused exclusively on brewing great-tasting craft beers with traditional beer ingredients, including malted barley, that are specially crafted to be gluten-free. Each batch of Omission Beer is tested using the R5 competitive ELISA test to ensure that it contains gluten levels that are well below the international standard for gluten-free of 20 ppm. Drinking is believing. Craft Brew Alliance was formed with the merger of leading Pacific Northwest craft brewers Widmer Brothers Brewing and Redhook Ale Brewery in 2008. With an eye toward preserving and growing one-of-a-kind craft beers and brands, CBA was joined by Kona Brewing Company in 2010. For more information about CBA, visit craftbrew.com. I’ll be attending the event next week, and bringing along our official gluten free beer correspondant so that we can get an educated taster to give the beer a try. We’ll post our results after the event! 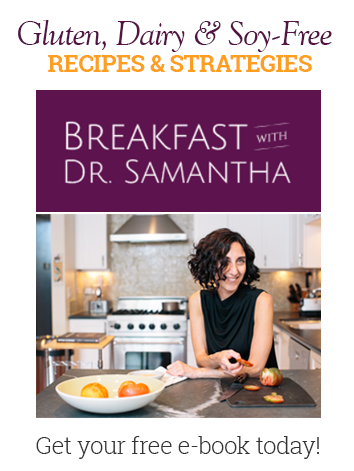 The March GIG meeting this Saturday hosts Tammy Credicott, author of The Healthy Gluten-Free Life . More information about the event is here on Grain Damaged. More Info: Call Lisa Shaver 503.577.9339, GIG of Portland branch manager. Later the same day, Tammy Credicott will be doing a presentation and book signing at Tula Gluten Free Bakery Cafe (our review here). 4943 NE Martin Luther King Jr. Blvd. Just a quick note that the February GIG meeting is this Saturday, with guest Laura B. Russell, who is the author of The Gluten-Free Asian Kitchen (our review here) and the columnist for The Oregonian. Friendly reminder: The room is in between N. Graham and the sliding glass doors of the atrium. Look for the signs. Our next meeting will be held this Saturday, the 2nd Sat of the month in a new location. Our new regular meeting space is still at Emanuel Hospital, still on the 2nd Sat of every month. It is now on the south side of the hospital at 501 N. Graham, Portland OR 97227. The room is called MOB, which stands for Medical Office Building. It’s a meeting space attached the the Medical Office Building. The room is in between N. Graham and the sliding glass doors of the atrium. Look for the signs. In February, Bob’s Red Mill will be hosting some gluten free classes. On February 9, author Laura B. Russell will be teaching a class on international soups. This class isn’t billed as gluten free, but it ends up being that way. Regular readers will be familiar with Russell’s great book The Gluten Free Asian Kitchen (our review here). We attended this class the last time it was available and really enjoyed it. On February 23, Kyra Bussanich will be teaching a class on making gluten-free holiday desserts. Kyra is the pastry chef at Crave Bake Shop, and recently won Cupcake Wars on the Food Channel. Call Bonnie at (971) 206-2208 at Bob’s Red Mill to reserve your space, and act fast because the classes fill up quickly. Flier with more info is available here (PDF). For the estimated 16 million Americans with gluten sensitivity, eating out can pose a real challenge. Now Oregonians can kick off the New Year with new choices, when SUBWAY restaurants across the state begin offering gluten-free sandwich options and gluten-free brownies as regular menu items after a successful test in Portland and Bend this summer. Oregon is one of a handful of states to offer these alternatives, based on its reputation for mainstreaming food trends that might be niche alternatives elsewhere. When Subway’s Oregon stores had the highest average number of gluten free rolls sold during the test, it was clear that gluten-free foods are popular locally. Gluten’s ubiquity can present a challenge for many families and work groups as they try to coalesce around a restaurant choice. SUBWAY’s wheat-free sandwich rolls and brownies are produced in a gluten-free facility and are individually packaged. SUBWAY sandwich artists are trained to prevent cross-contamination during the sandwich-making process. For example, one employee will prepare a gluten-free sandwich order from start to finish. Other techniques include single-use knives and eliminating contact between traditional sandwich rolls and other ingredients including meat, cheese and vegetables. Speaking of fast food, Burgerville, Portland’s much-loved burger chain, has come out with gluten-free buns that they are testing at two restaurants locally (25th & SE Powell in Portland and Fisher’s Landing in Vancouver). We went to one of the restaurants to check it out ourselves. 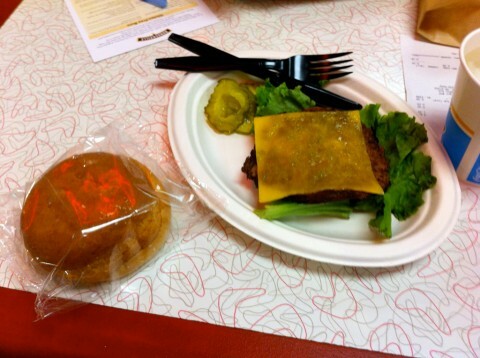 As you can see from the photo above, the bun is delivered in a wrapper to help prevent cross-contamination. We were also handed a questionnaire to fill out. After having heard so much about Burgerville from people we know, we were unprepared for how unappetizing their burgers were. The patties were overcooked. We both felt like the bun, which is produced by Udi’s in Colorado, did not compare well to the buns you can get from Jensen’s. The buns were dry, crumbly, and generally unappetizing. Of course, since the buns were being served in a package, there was no way to toast them, so I guess that would be expected. 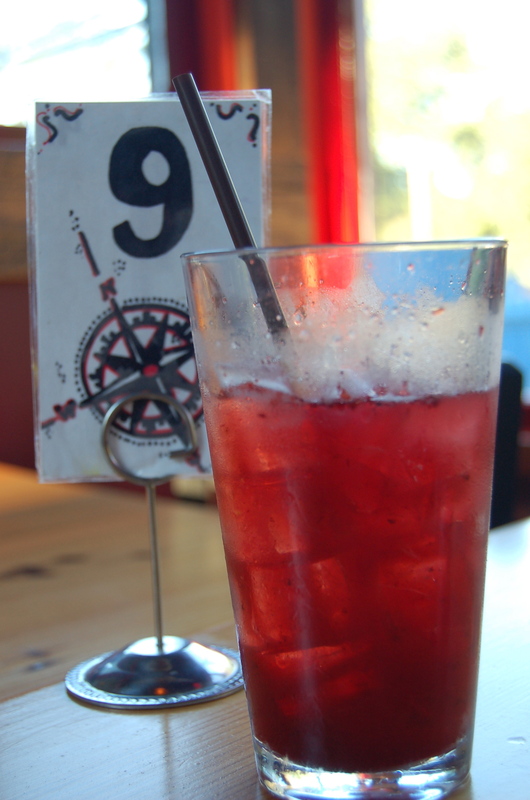 On the plus side, the staff was extremely friendly, and the food came out fast. On the minus side, the restaurant was freezing cold. 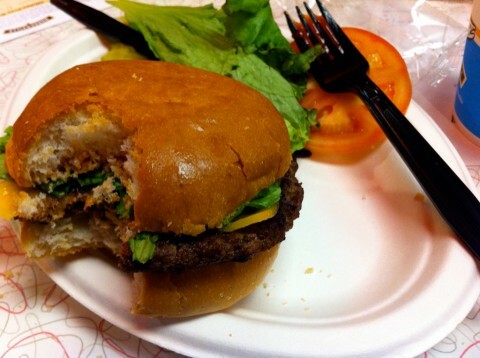 Did we mention that the burger patties weren’t very good? If you want to try them out yourself, Burgerville will be testing these buns until January 12, so you still have a few days left to try them.